By W. L. Pierce. A concise refutation of the commonly heard allegation that the National Socialist government of Germany was a proponent of gun control. 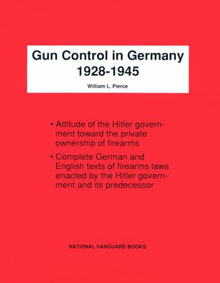 Pierce shows that the Hitler government actually facilitated private gun ownership. Contains the complete text, in English and German, of the firearms laws enacted by Hitler and those of his centre-left predecessors. A4 format, P/B, 48pp.